Founded in 1919 by Frans G.J. Beerkens, a visionary and entrepreneur that dared to do things differently. A man with a passion to be distinctive, and establish a business for future generations. Growing up in the Netherlands, under the threat of war, his working life started out selling wood and coal. A move to Randstad led to him working with the pioneer, Anthony Fokker and contributed to the construction of the aircraft, Fokker VII and developing his prudence for spotting an opportunity. Such an example of insight was securing the exclusive rights to sell a revolutionary glue that was both resistant to tropical heat and damp and used in the wing and outer shell construction of the Fokker VII. Following the end of WW1, rapid expansion of the waterways network and development of railways caused congestion and trading difficulties, particularly for a wood specialist. In 1932, Beerkens Senior made the decision to relocate to Rigakade in Amsterdam. This strategically placed location was proved to be a profitable move, clients were now closer and the transportation of trees, beams and planks could take place unhindered allowing the business to grow. Fetim secured the order to supply all highly prized timber to the Royal Tropical Institute for a huge project which would become known as the â&#x20AC;&#x153;Tropenmuseumâ&#x20AC;?. concepts help our customers be champions in their industry. 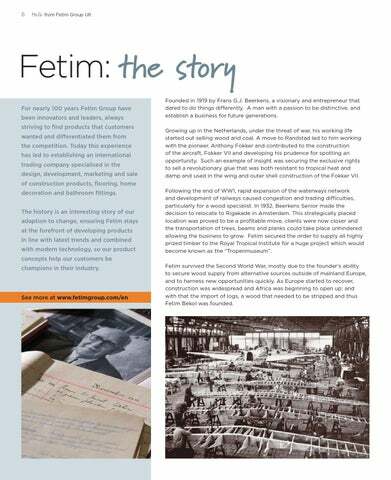 Fetim survived the Second World War, mostly due to the founderâ&#x20AC;&#x2122;s ability to secure wood supply from alternative sources outside of mainland Europe, and to harness new opportunities quickly. As Europe started to recover, construction was widespread and Africa was beginning to open up; and with that the import of logs, a wood that needed to be stripped and thus Fetim Bekol was founded.